Before we get to our usual benchmarks I put together a few hand timed tests to help convey the experience the Momentus XT offers. Seagate badly wants the world to think that the Momentus XT is SSD-like in its performance. In my opinion it performs more like a fast hard drive rather than an SSD, but regardless of what you want to call it the tests below are designed to help convey the user experience. 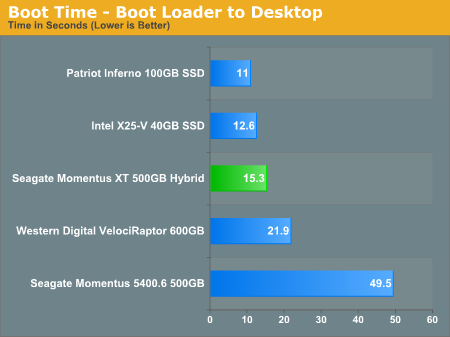 To aid in our comparison I've thrown in two SSDs: the Intel X25-V and the Patriot Inferno. The X25-V is a small, but affordable SSD while the Inferno is based on the SandForce SF-1200 controller making it one of the fastest and most expensive consumer SSDs we've tested. We've also got the new 600GB VelociRaptor and Seagate's own Momentus 5400.6, a fairly standard 5400RPM 2.5" drive for comparison. While a better comparison would have been a modern 7200RPM 2.5" drive, we didn't have one handy in time for this review. The 5400.6 should give you a general idea of how all 2.5" drives will perform though; 7200RPM drives will be faster but not by a huge margin. These are mature results, measured on the third of three runs so the Momentus XT has more than enough time to learn (between each run I rebooted the machine). Our first test is a timed boot. You are looking at the time from initial OS load (not POST) to getting a cursor at the Windows 7 desktop. The Windows 7 boot process is a very read intensive task that's easy for the Momentus XT to learn. Seagate may be on to something here, the Momentus XT is much more like a SSD than a HDD in this test. Even the VelociRaptor is no match for it. 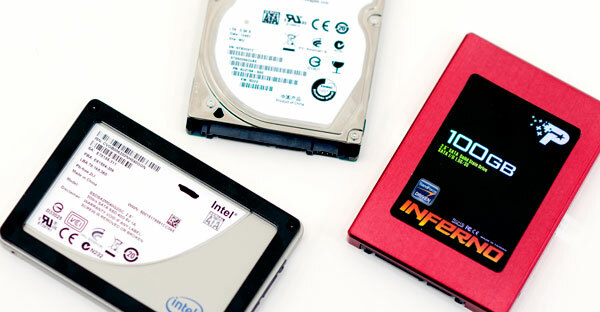 The SSDs are still faster, but they don't offer nearly the same capacity as the hybrid drive. Compared to a standard 2.5" notebook drive the Momentus XT is a no brainer, it's in a league of its own. Adobe's Photoshop CS4 is a great application launch test as it can take a fairly long time to load. Here we're just timing the period from clicking on the CS4 icon to ending up at the Photoshop workspace. 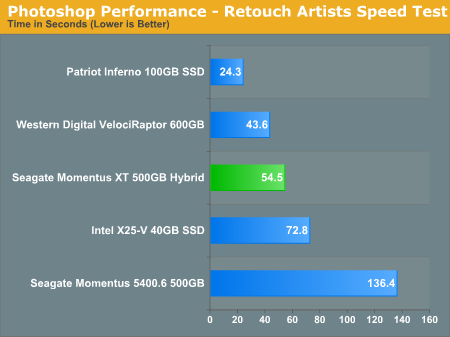 The new VelociRaptor is slightly, but consistently faster than both of the SSDs in this chart. It does still have a few tricks left up its sleeve. 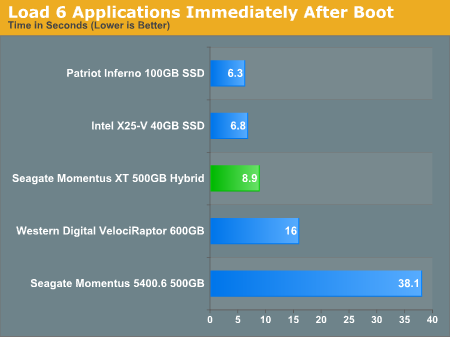 The Momentus XT is about half the speed of the SSDs and 10K RPM HDD here, but much faster than the 2.5" 5400RPM notebook hard drive. It's noticeably faster than your standard notebook HDD but it does feel slower than a SSD. That is an important distinction as throughout my experience with the drive it felt like a fast hard drive, rather than an SSD. Part of the reason there is because the NAND isn't used for writes, so you still get the high latency response time whenever there are any random writes happening in the background. 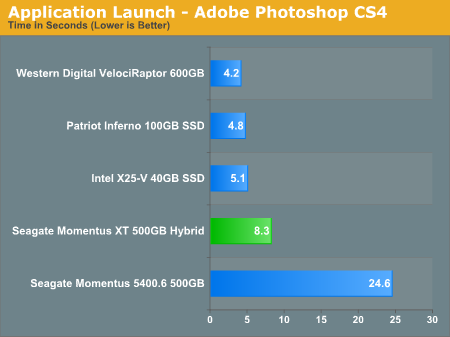 Our standard Photoshop CS4 performance test in our reviews is optimized for comparing CPUs and as such it's set to only record the previous action. With only one level of history, the benchmark is not nearly as disk intensive as Photoshop can get. For this test I ran our CS4 benchmark but left the application at its default setting of remembering the previous 20 actions. With more to keep track of, performance goes down while the reliance on a fast storage subsystem goes up. The X25-V is penalized by having a very low sequential write speed. The combination of heavy reads and writes means that the Momentus XT behaves more like a normal hard drive and less like an SSD. The 4GB SLC read cache does help though, while the hybrid drive isn't faster than the VelociRaptor it's pretty close for being a 2.5" notebook drive. The 100GB SandForce drive is much faster than anything else here, but it does offer 1/5 the space at 2.5x the cost of the Momentus XT. The results are a lot closer than you'd expect. Despite having a 4GB SLC NAND read cache, the Excel load time isn't any better than the VelociRaptor (although it is faster than the 2.5" 5400RPM drive). The upper bound in performance is set by the SSDs so it looks like the Momentus XT's cache does as much as physically possible to improve performance, we're simply bound elsewhere. My favorite test for showing the usefulness of an SSD is to load a bunch of applications immediately after booting to the desktop. On a system with a hard drive there are usually a lot of disk accesses right after you hit the desktop that will slow down any application launches. A well made SSD acts like nothing is going on in the background. But what about the Momentus XT? I'm impressed. 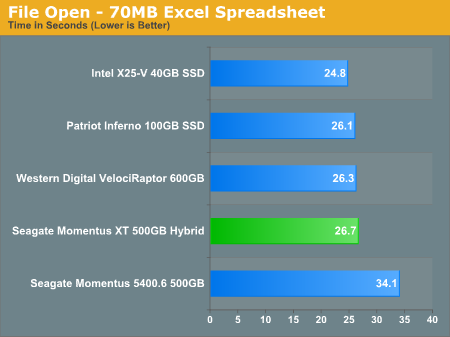 While it's not quite as fast as an SSD, Seagate's Momentus XT is faster than any hard drive here. It's fast enough in this test where you might even consider using one in a desktop instead of a VelociRaptor. There is still the issue of random write performance (it is a 7200RPM 2.5" drive after all) but this is very good. It's because of this that Seagate believes the Momentus XT is delivering a SSD-like experience and in this test I'd have to agree. As much as I miss my girlfriend who's been on the other side of the world for two weeks... I've missed you more, Anand. HAHA that's awesome. well, not for your girlfriend. Between the 5400.6 and the WDVR you should be able to get a good idea of where this thing falls though. Yeah, the one thing though is that having, say, a normal Momentus 7200 would allow us to tell if the NAND is really offering us a benefit over a drive without it, and if so, what percentage performance increase can be attributed to it. The issue with that line of thinking is that this drive is not just HDD+SSD, the algorithms that the drive uses to read and write data is on a vastly different ball field. This drive is an HDD with SSD capabilities and sometimes benefits.